So, could I connect a threaded rod for a 3D printer? You now officially have every item I ever had to go to Jameco for. Thank you... for blowing them out of the water. I ordered a few pairs of these knowing that the set screw size was 4-40 and that they came with set screws, however, I had expected the hub screw holes to be 6-32. I suppose I shouldn't have expected this since it doesn't mention 6-32 in the description, yet, at the same time, it DOESN'T mention the size of the screw holes on the hub AT ALL in the description anyway. So, just FYI to everyone who doesn't have a habit of looking at every dimensional drawing for every part ordered, the screw hole sizes on the hub are 4-40 as well. Plus, you may also want to note that these hubs are NOT at all compatible with the Actobotics product line. The holes do not line up no matter how you orient them. These hubs are manufactured by Pololu, not Actobotics. This fact isn't stated in the description and was another contributor to my confusion. But, I know now. And, despite all the confusion, it's a pretty nice hub. It holds tight. The 4-40 screw hole size in the hub is in the dimensional drawing. Too bad it wasn't in the description. But it still is not compatible with Actobotics. I really like that I can just pop over to You-Do-It-Electronics and buy these now. It simplifies things massively. 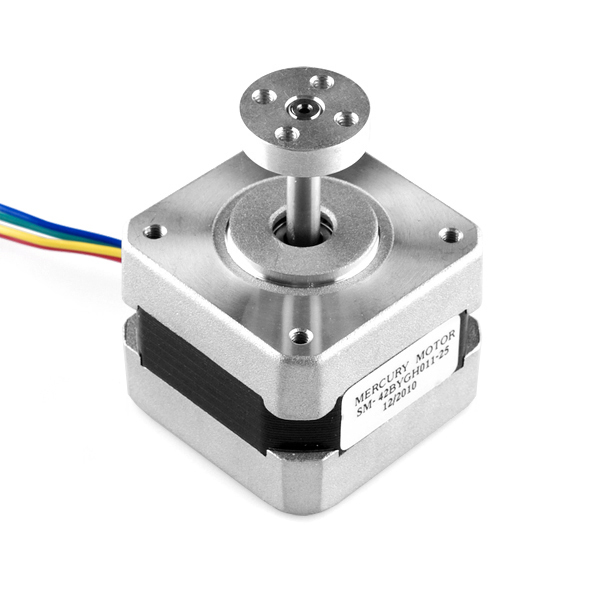 Would it work with a 4mm shaft motor? Hi, I lose allen key. Which is the size of allen key? 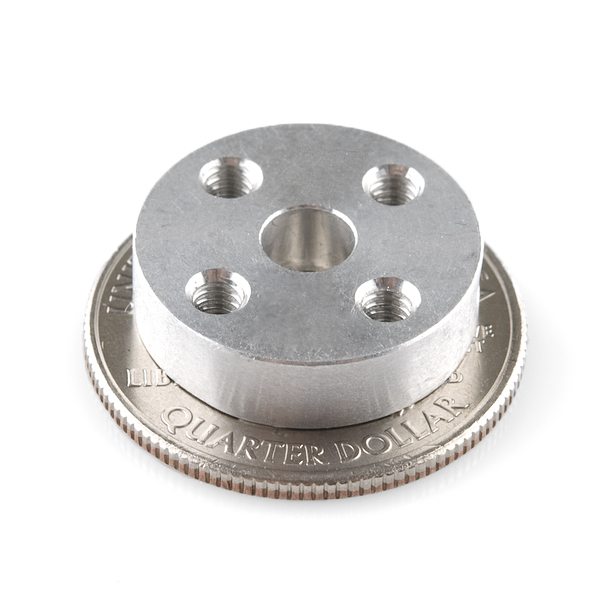 If the metric ones are more common, look for a 1.25mm (metricized) or 1.3mm (proper metric) one, or a kit with one. Either should be close enough to the 0.05" to work. hi can someone confirm that the allen wrench that comes with the item is 1mm allen wrench ? 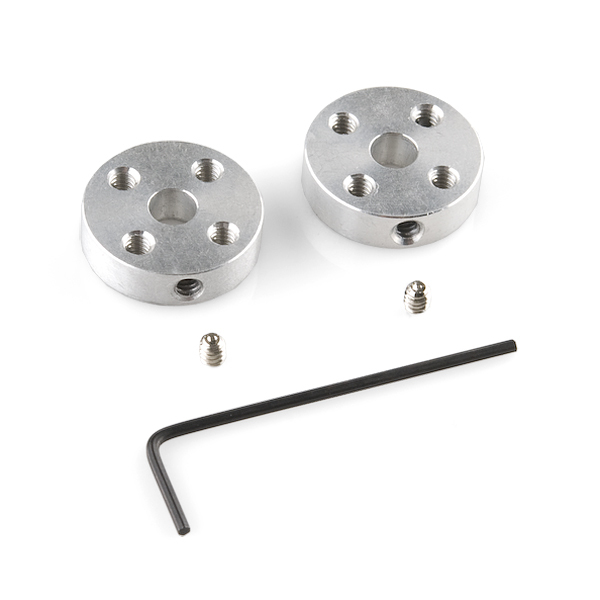 Helpful Note: I purchased something similar to these and I ended up buying a threaded rod of the same size from McMaster to replace the itty bitty screws that come with this. so i bought 5 of these, and when i got them i realised there was no screws in the bags to mount the two hubs together. And the holes are so damn small i cant find matching screws.. There should have been set screws. Please contact customerservice@sparkfun.com. Vegard said there were no screws "to mount the two hubs together", so it doesn't sound like he's complaining about missing set screws (the set screws are for mounting the hub to a shaft, not to another hub). 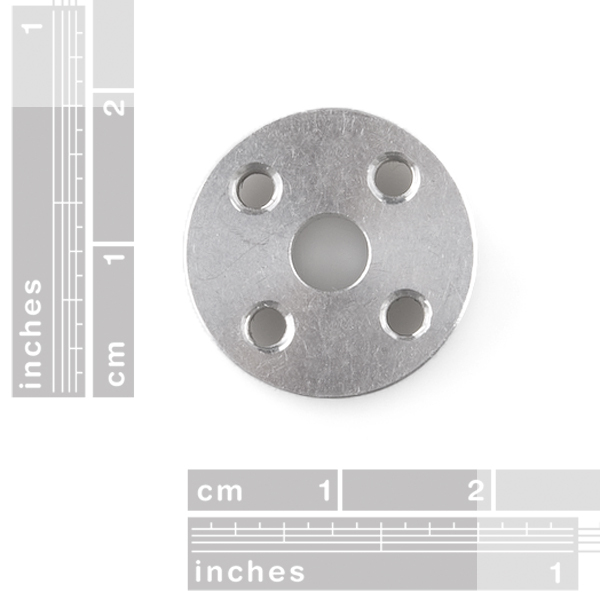 The threaded holes for mounting the hub to another object are for common #4-40 screws, which can be found in whatever length is best for your project at most hardware stores (e.g. Home Depot, Lowes, etc). In Australia we refer to those "two 4-40 set screws" using the British term, Grub Screws. Everything came just fine in the package, and the included hex key for the grub screws was very well made. The hubs sit very tightly on D- or round shafts and seem to be quite sturdy. I wouldn't hesitate to buy more if I needed them in the future. Exactly what was ordered and work just great! I hope they come up with some larger 5mm ones for bigger projects. They are VERY tough to find. Oh yeah, I wasn't sure what length screws I needed until I assembled everything, so I bought the screws from the local hardware store as the screws are a common size. Solid product. Well-made and light, but I won't have the chance to try them in my project. I purchased these under the mistaken impression that they would work with the Actobotics sprockets I bought to mount to them. Alas, they do not. Reading the comments, it seems I'm not alone in this discovery. I don't fault the manufacturer or Sparkfun at all; I blame myself for getting lazy and making assumptions. Sorry to hear they won't work for your application. If you contact our tech support team, they'll be able to arrange a refund for you if you'd like.